Despite drives to bring more gender equality to the technology world, women are still alarmingly underrepresented. A 2014 study showed that the number of females in key roles in the technology industry hadn’t changed in over 10 years, and a Deloitte study in 2016 predicted that by the end of the year, fewer than 25% of digital jobs will be held by women. And yet, over the years, women have played a major role in the development of technology. Without their intellect and ambition, we wouldn’t be where we are today. While her father was the famous poet, Lord Byron, her mother was mathematically trained and insisted her daughter follow in her footsteps. In 1843 she translated and published an article on the Analytical Engine by an Italian engineer, Luigi Menabrea, and added extensive notes of her own. Her notes included the first published description of a stepwise sequence of operations for solving certain mathematical problems. Because of this Ada is often referred to as 'the first programmer'. Her notes also have a visionary quality, as she speculated that the Analytical Engine: “might act upon other things besides number [...] the Engine might compose elaborate and scientific pieces of music of any degree of complexity or extent”. The idea of a machine that could change symbols in harmony with rules and that numbers could symbolise entities other than quantity marks the transition from calculation to computation. Ada was the first to explicitly refer to this notion and in this, she appears to have seen further than Babbage. As such, she has been referred to as 'prophet of the computer age'. Next, she enrolled in MIT and became the first woman to earn an M.S. in Electrical Engineering. Despite her prestigious credentials, no one would hire her. After a stint in Istanbul teaching physics at a woman’s college she returned to the U.S. to take on a role at General Electric. It was at GE that created the Clarke Calculator. This graphical device solved equations used to send power through electrical transmission lines longer than 250 metres. Her contribution to transcontinental telephone communication elevated her status, and in 1922 Edith Clarke became the first professional female electrical engineer. Also known as the Queen of Software, Grace Hopper was a computer scientist, Yale Ph.D., and United States Rear Admiral. In 1945, after a decade of teaching, Hopper joined a new volunteer branch of the Navy known as WAVES (Women Accepted for Volunteer Emergency Service). During her incredible career, Hopper worked on UNIVAC I, the very first commercial computer produced in the U.S., and created the first compiler. She is also credited with coming up with the term “computer bug” when she found an actual moth inside the UNIVAC I.
Hopper also invented FLOW-MATIC, the first English-like data processing language, which helped spark the development of COBOL, which eventually became the Navy’s standard operating language. 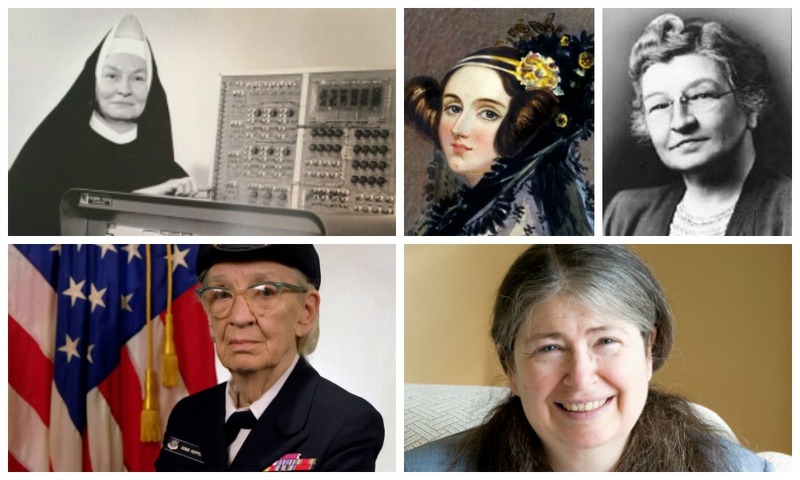 Did you know, the first woman to receive a Ph.D. in Computer Science was actually a nun? Mary Kenneth Keller entered the “Sister of Charity” in 1932. Keller received her bachelors and masters in mathematics from Chicago’s DePaul University and briefly studied at Dartmouth, breaking the traditional “men-only” rule. While at the University, Keller played a significant role developing a key computer language: Beginner’s All-Purpose Symbolic Instruction Code, or BASIC. Because of BASIC, writing custom software was no longer restricted to mathematicians and scientists, and so it helped make computer use accessible to a larger proportion of the population. In 1965, received her Ph.D. from the University of Wisconsin and Clarke College in Dubuque, Iowa gave Keller a job to create and chair their Computer Science Department, where she shared her knowledge for two decades. Radia Perlman is often described as the ‘Mother of the Internet,’. However, she insists that is was not created by any one individual. Perlman did, however, come up with the algorithm behind the Spanning Tree Protocol (STP). It is an essential part of the Internet’s underlying foundation. As a child, Perlman put a lot of pressure on herself to get straight A’s, but she naturally gravitated to math and science. She went to study at MIT and was just one of a handful of females in her class (fewer than 50 of 1,000 students). In 2000, Perlman published her textbook, Interconnections, which simplified network routing and bridging.